← Today we leave Zeuthen in former East Germany after 39 days. 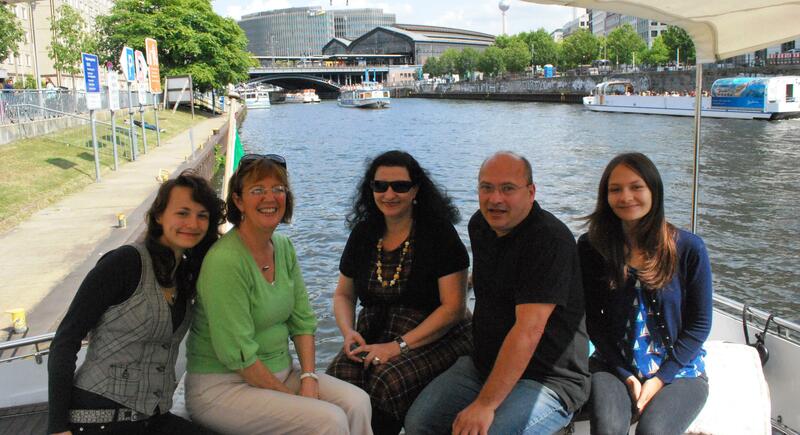 On Thursday, in Berlin, we met Nuala’s friend Heike and her family, husband Ewe and daughters Larissa and Nina. 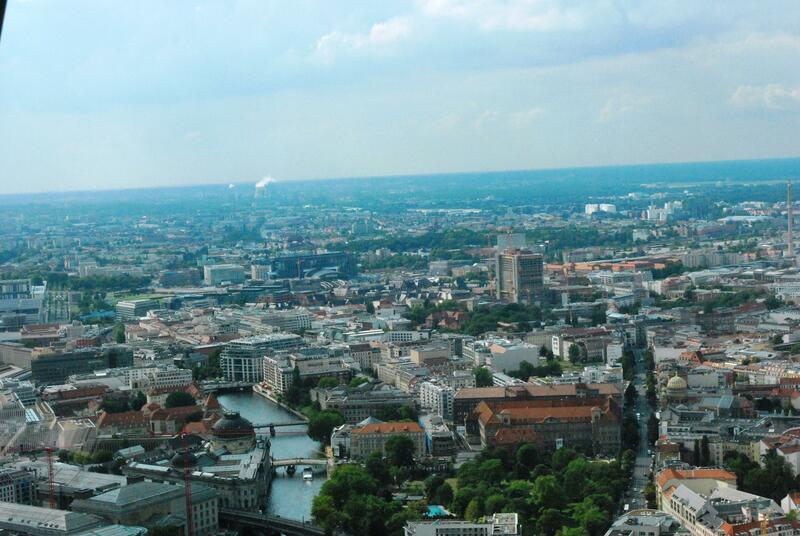 They had lunch on the boat with us and afterwards we all went for afternoon tea in the Berlin TV Tower. After visiting the TV tower, I had to come back to the boat, as my knee was really bothering me (even though Larisa had given me a set of crutches and I was trying to get the hang of them). So Nuala went off with Heike (to have their own catch up after 37 years) and I got a taxi back to the boat. I sat on the deck in the lovely evening sunshine, had a beer and watched the boats go by – wonderful! As it was getting dark and there was no sign of Nuala, I went below and made some dinner. While having dinner, I heard Nuala’s voice outside. She was talking to someone and trying to sell them the boat (we have ‘For Sale’ signs in German up on it and you know Nuala when she decides to do something she goes all out- and now as we have decided to sell the boat she is giving it her best shot). I said to myself ‘please don’t let her bring people on board’ (I had not cleaned up and the sink was full of dirty dishes). But in comes Nuala, with two German men in tow! They had a look around the boat and said very nice. They then asked me what happened to my knee. They then said that they were orthopaedic surgeons from Southern Germany in Berlin for a conference and they asked to see my knee scans. One of them took over my computer and went through all the scans of my knee (about 40). They had a discussion in German, looked at the scans again and asked me to show them how I used the crutches. They made me go up on deck and walk with the crutches. I was not using them correctly. Using a dictionary they gave me their diagnosis which was that I had an unusual injury. They agreed with the diagnosis of my Irish consultant but said I needed to exercise the knee putting light pressure on it to encourage the bone to heal. They showed me the right way to use the crutches. They made me walk cross the deck again and again until I got it right. One of them asked me to walk putting my bad foot (left leg) on his hand (which he put on the deck), to show how little pressure I must put on that foot (he joked and said if I got it wrong I could ruin his career as he is a surgeon). They then thanked us for showing them the boat and left. I don’t know their names, all I got was an email address! Today we visited the DDR (Deutsch Democratic Republic) museum and Alexanderplatz. I walked around Berlin using the crutches as they taught me. Magic! It worked. I could walk a lot faster and my knee did not hurt as much as before. Once again the Gap Year has amazed me. The right people have shown up to help me at the right time. That’s why it’s much more important to tell you about the men that Nuala brought home than our visit to the Berlin TV Tower, which was wonderful. 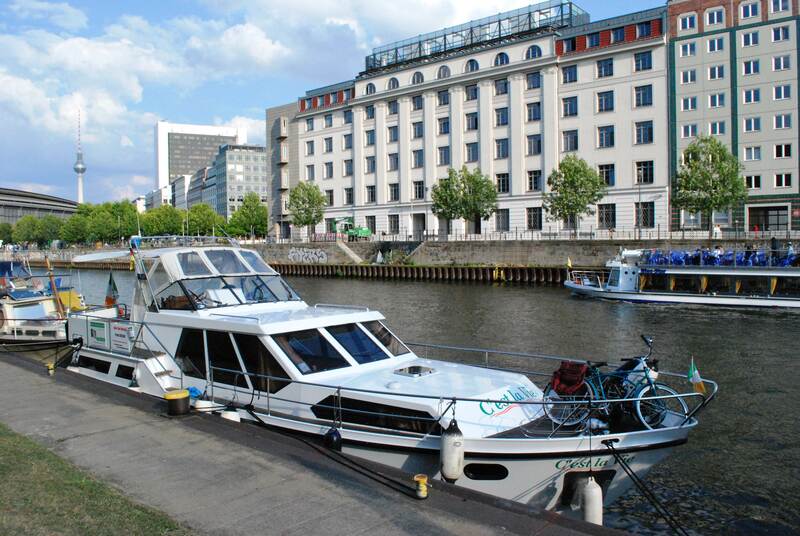 This entry was posted in Adrian injury, Berlin, C'est La Vie - The Boat, front page, On the Journey, People We have Meet on the Gap Year and tagged Alexanderplatz, Berlin, Berlin TV tower, DDR (Deutsch Democratic Republic) museum. Bookmark the permalink. 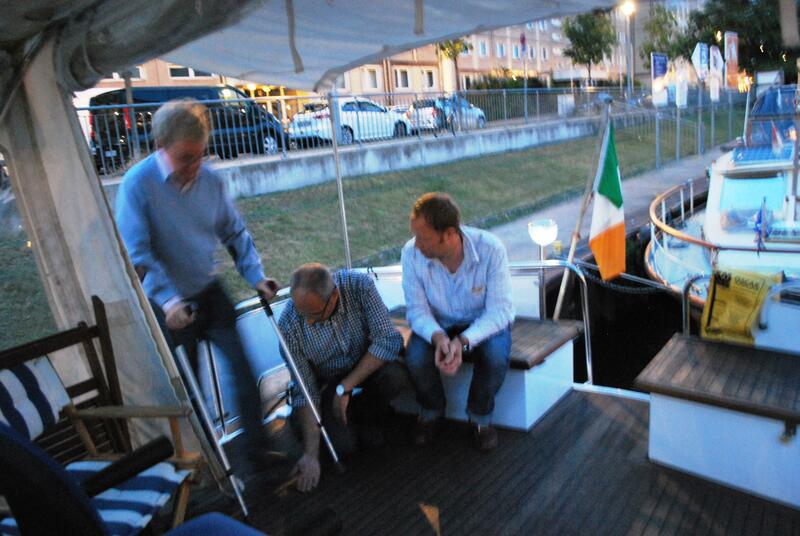 7 Responses to Nuala brings two men she met on the quayside, to the boat! Somehow I seem to know that story already…have my spies! Wow Nuala what are you like .., did you even get their names.. ? As I told you in Meaux, if you leave yourself open an Angel, or two, will arrive.